There is a dedicated beam line, equipped with a RADiation Effects Facility (RADEF), for studies of single-event effects (SEE) in electronics. The RADEF facility is also available for various radiation hardness tests of materials, sensors and detectors with light ions and heavy-ion cocktail beams. The RADEF facility is located in the Accelerator Laboratory at the University of Jyväskylä, Finland. The facility includes two beam lines in the same cave, dedicated to proton- and heavy-ion irradiation studies of semiconductor materials and devices, as well as a separate linear electron accelerator (clinac) for electron and X-ray irradiation studies. The main cyclotron used at JYFL is a versatile, sector-focused accelerator. Its three external ion sources allow it to produce proton beams at energies ranging from about 500 keV to about 55 MeV, as well as heavy-ion beams up to energies of 16.3 MeV/nucleon (2059 MeV for xenon). For more information on available species and their LET values in silicon, please refer to our available cocktails section. The main line (Heavy-ion and low-energy proton line) allows for low-energy (usually up to 6 MeV) proton irradiation in vacuum, and heavy-ion irradiation both in air and in vacuum. This line is fitted with a large vacuum chamber, which includes remote-controlled component movement apparatus and collimator, and ion beam diagnostic equipment for real-time analysis of beam quality and intensity. The High-energy proton line is dedicated to higher-energy (>6 MeV) proton irradiation in air. This line is also fitted with beam diagnostic equipment. Unlike the main beam line's, the proton line's component movement apparatus is not remote-controlled and the user has to operate it by hand. 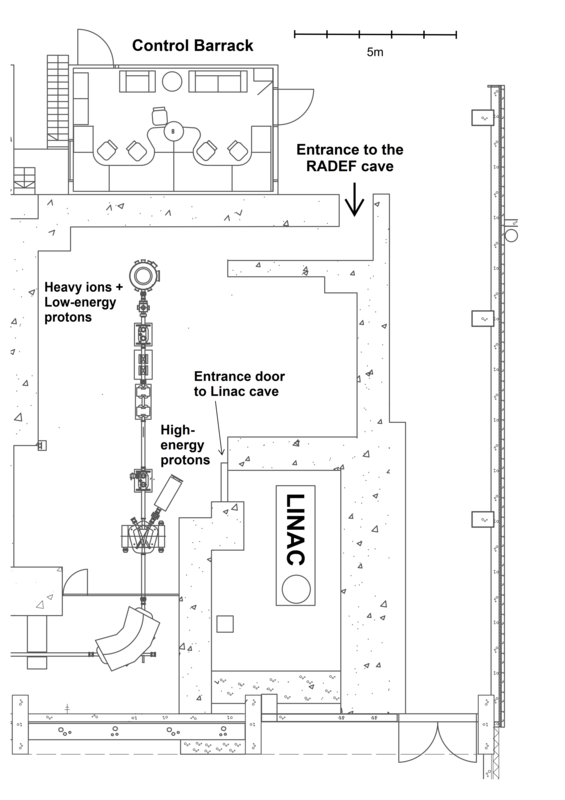 The RADEF linac is located in its own bunker within the RADEF cave. It can create pulsed electron beams at energies ranging from 6 MeV to 20 MeV, which can be directly used for component irradiation, and may also be converted to pulsed X-rays. The control station for the RADEF equipment and the user work station are located outside of the experiment cave. A series of interfaces are available to link the devices under test to the user's test equipment. We advise our customers to check that their interface requirements are met to avoid possible setbacks on the day of the experiments. RADEF can supply equipment such as power supplies and oscilloscopes to fit its customer's needs. Please do not hesitate to make enquiries, if you have a need for other specific equipment.